Helping West Michigan businesses grow in Allegan and Ottawa Counties. Business leaders grow companies, we give them an advantage. Subscribe to occasional email updates with news and updates. SURGE is the one-stop resource for entrepreneurs and startups to access Holland SmartZone assets, programming, events, connections, meetups and more. Along the lakeshore, the Michigan Smart Coast boasts company innovation, professional fulfillment and continual sources of weekend entertainment. Did you know that in addition to shops, restaurants and cultural institutions, Downtown Holland also has a thriving industrial scene? Watch to learn what's behind the name and faces of Cento Anni! Three West Michigan children turn the question of "What do I want to be when I grow up" upside down. The West Michigan Lakeshore Region economy is vibrant and companies are expanding. The 2018 Business Intelligence Report reveals the vital statistics growing companies in the region share. 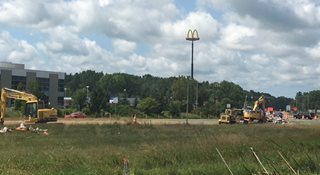 The Zeeland Interchange BL I-196 improvements were catalyzed through efforts led by Lakeshore Advantage. Read more to follow the progress updates. No one gets out of bed at 5am with a focus on the present. Lakeshore Advantage and you, moving forward together.